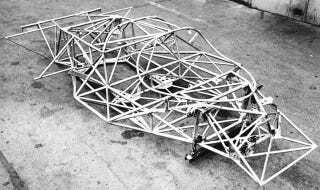 The 917 was a Le Mans- and Can-Am-dominating racecar that appeared in races starting in 1969 all the way up to its last appearance under Kremer Racing in 1981. Here's what it looks like underneath all of its gorgeous bodywork. Immediately noticeable is that the most protected area of the car is where the engine goes, not the driver. My, how things have changed. That is a good reason not to punt anything with the front of your car, though. When I was little, the best playground big toys were the ones that looked like real things: boats, cars, castles—you get the idea. This looks like the best jungle gym ever created. Sticking the marvelous flat-12 engine and all the other bits back on is just icing on the cake. Can I play with it? Please?